In Leeds there are over 13,000 reports of domestic violence against women each year as well as the highest number of rough sleeping women and the highest level of female re-offence in the UK. Therefore, we found it impossible to ignore the social exclusion facing the women in our city. We approached Together Women, a probation centre that offers a safe environment for vulnerable women. The centres provides basic support services but were unable to offer reintegration opportunities. Further possibilities emerged by realising that women who had been in prison had different concerns about social exclusion than those who had not. This form of exclusion (forced removal from society through punitive justice) can often be prevented with intervention at a younger age. However, within WISE, there were no methods in place to prevent social exclusion from ever taking place. By working with both girls and boys from a younger age in order to help teach life skills, there could be a focus on prevention rather than only helping after exclusion has taken place. 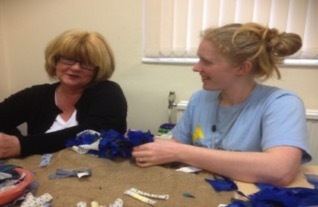 After approaching the Together Women Project in Leeds, WISE the TWP made a partnership. WISE has run weekly sessions in their centre for three full years in which we have taught man women craft and life skills in order to help them in multiple ways. The most important way we help the women is by increasing their confidence and self-worth. By proving to the women that they are capable and valuable as an individual, their confidence increases and it allows them to believe in themselves. This confidence can then be used to help the women gain employment. It can be hard enough to get a job with a criminal record but without confidence or self-worth it can be even harder to convince employers that you are worth their time. This is where WISE helps women, by allowing the women to believe in themselves, it makes them more competitive in the jobs market. This also benefits the wider community as it means there are more people earning and fewer people on benefits. To tackle the problem identified with those from a criminal background, we decided to take action within the prison system. By using our contacts with Together Women we developed a partnership with their project within Askham grange and together we are developing a programme called WISE Within. It is a programme to help prepare women leaving the prison system for life beyond the prison walls. We are planning to get this partnership started in September 2015. Working to prevent exclusion is a main focus of ours at the moment. We have set a WISE Roots programme in the Cardigan Centre in Leeds to work with both men and women aged 16-24. This group will have more of a focus on employability and life skills. With a stable income and the ability to live independently with confidence, young adults who are at risk of offending have more of an incentive to stay out of trouble. The workshops started in April 2015 and have started with a focus on the creation of a good CV in order to impress potential employers. This year 50 women have attended at least 1 session, 4 online shops have been created that are run by these women, 40 women more confident in society and 35 women have stated that they feel more motivated to be pro-active (e.g. in job hunting, changing unwanted behaviours etc.). Our plans for the future include to continue the great work we are doing in the TWP centre and Cardigan Centre in Leeds and to ensure the setup of WISE Within in Askham Grange happens smoothly and promptly. There are also ideas to help vulnerable males in Leeds in order to ensure that we provide equal opportunities for both sexes but ensuring both are kept separate to ensure all beneficiaries feel they are in a safe environment at all times. Susan* was struggling with mental health issues and after a few months in hospital found herself isolated and anxious about re-entering her local society. Her first session with WISE she spoke quietly and not in front of the group. Working with her on a one to one basis, we helped her set up and develop an online presence for an old business idea she had. After a few sessions, she soon became the loudest member of the group, often making jokes and having a laugh. Susan is now an integral and very chatty member of the group. Her confidence has improved so much that she runs her own sessions at the TWP Centre in which she demonstrates her business for free and allows others to benefit from her work. From a woman who could not speak in front of a group, to a woman now running her own small business, Susan is a prime example of what WISE is all about.